You say potato, I say pot-ah-toe ... chip. And that's just the start of it. Though thin and flat may be the national standard — and bestselling variety — of this ubiquitous snack, regional and sometimes hyper-local preferences for different calibers of crunch, thickness, seasonings and endless other elements have created a surprisingly diverse culinary patchwork of chip styles around the country. 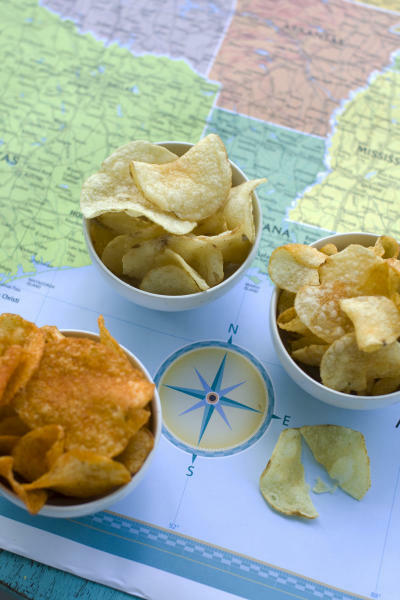 That's right — the chips you nosh in the Northeast could be wildly different than those savored in the South. Midwesterners, for example, prefer a thicker, more substantial chip. Big, hearty chips also sell well in New England and the Rockies, though in the latter area those progressive mountain folk want theirs with artisanal seasonings. Southerners love barbecue flavor, chip industry executives say, but it needs to be sprinkled on thin, melt-in-your-mouth chips. Southwestern states predictably go for bold and spicy. Local flavors — such as New Orleans Cajun and Mid-Atlantic crab seasoning — find their way onto chips in those places. And people all across the country, it seems, love a curly, shattering kettle chip. "People like the potato chip they grew up with," says Jim McCarthy, chief executive officer at the Rosslyn, Va.-based Snack Food Association, a trade group that represents the many denizens of convenience store shelves. "There's a very strong brand recognition and brand loyalty to the chip you grew up with." Potato chips are America's number one snack, according to the group's 2012 state of the industry report, and we spent $9 billion on them in 2010, 50 percent more than what we spent on the No. 2 snack, tortilla chips. More than half of those sales go to Plano, Texas-based Frito-Lay North America, whose original thin, crispy chip is the top-seller. But hometown styles still claim their territory. In the Pacific Northwest, Seattle's thick-cut Tim's Cascade Style offers big bite and bigger flavors, such as jalapeno made from real peppers and a salt and vinegar chip that "makes you pucker" says Dave West, sales director for the company. Over in the Rockies, kettle-cooked Boulder Canyon chips pair their crunchy bite with artisanal seasonings such as red wine vinegar, spinach and artichoke, and balsamic and rosemary. Down the map in the Southwest, Arizona-based Poore Brothers offers two varieties of kettle-cooked chips with mouth-numbing heat from jalapenos and habaneros. "People in this region really tend to like this pepper, these stronger, spicier flavors," says Steven Sklar, senior vice president of marketing at Phoenix, Ariz.-based Inventure Foods Inc., which owns the Boulder Canyon and Poore Brothers brands. "You've got a hard bite with a strong flavor. The combination makes a big difference." While Southerners like spice, industry executives say, the region's traditional chip is thin and flaky. "The southern consumer prefers a lighter, thinner potato chip," says Julie McLaughlin, director of marketing at Birmingham, Ala.-based Golden Flake Snack Foods, which makes Golden Flake Thin & Crispy Potato Chips. The company sells across 10 states in the Southeast, McLaughlin says, and its best-selling chip is "Sweet Heat Barbecue," one of five barbecue varieties it makes. Golden Flake also offers a thick-cut, wavy chip, McLaughlin says, "for the transplants." And then there are the niche chips, the hyper-local flavors that connect people to their culinary heritage. In New Orleans, Zapp's makes "Spicy Cajun Crawtaters," designed to mimic the flavor of a seafood boil. Nottingham, Penn.-based Herr Foods makes a Philly cheesesteak chip, as well as one meant to taste like boardwalk fries. For other Mid-Atlantic producers such as Hanover, Penn.-based Utz Quality Foods and the Mount Jackson, Va.-chippery Route 11 Potato Chips, crab seasoning is must, but may be for locals only. "If you've never had a blue crab experience, or been at a crab feast, you're kind of like, 'What is this?'" says Sarah Cohen, Route 11 president and co-founder. "If I see somebody ordering a lot of crab and they're in Kansas City, we'll call them up to see if they understand what the crab is. Usually they don't, and they're thankful that we called." Advances in potato chip making technology and distribution have flattened what may once have been a much wider variety of regional chip preferences, some analysts and executives say. Potato chip making began in the mid-19th century with mom-and-pop operations in practically any small town with access to potatoes, oil and a kettle to fry them in. Today, the industry uses "chipping potatoes" grown specifically for the purpose, and has developed technology to produce a more uniform chip. 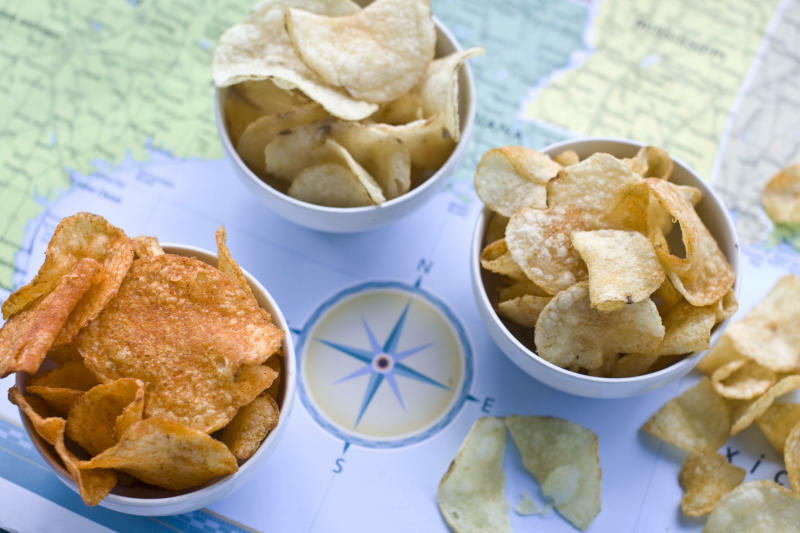 Advances in packaging and the emergence of big box chains mean chips now can travel much farther, spreading once local tastes throughout the country. "Through the mass marketers, through Costco and BJs, Walmart, a lot of product that was regional has now become national," says the Snack Food Association's McCarthy. "You can find Utz potato chips in California and before you couldn't." For sure, standardization and competition from giant producers like Frito-Lay may have squeezed some smaller companies out of business, executives say. But it may be the predominance of those flat, mass-produced chips that has also kept regional passions alive. "Trying to compete with the giants out there hasn't been successful," says Inventure's Sklar. "That's where regional players like Poore Brothers come in with a different product and then regional flavors to enhance that. Going head-to-head with Frito-Lay on a flat chip just isn't going to work." But even Frito-Lay plays the regional flavors game. The company began experimenting a decade ago with flavors like "Chicago Steakhouse Loaded Baked Potato," and "San Antonio Salsa." Today, it offers roughly a dozen specialty flavors such as Wavy Au Gratin in the Midwest, Garden Tomato & Basil in the East, and a thick-cut Deli chip for Colorado. Executives create new flavors by surveying popular items and food trends in the different regions, said Ram Krishnan, Frito-Lay vice president of marketing. But today they also employ Facebook and other social media to crowd source preferences. In contests that have been held around the world, the company invites consumers to suggest new flavors on the company's Facebook page. The current contest, the first in the United States, runs through October 6. Flavors like sautéed onion and ketchup, smoked salmon, and bacon — with anything from cheese to chocolate — have been suggested. Some flavors that started out as regional specialties — for example, Limon, originally for California — have gained a wider audience. "What always happens is that a lot of the regional cuisines have expanded and become more mainstream," says Krishnan, suggesting, for instance, that the popularity of Mexican food has helped the "limon" flavor gain fans. "We always find we launch these regional flavors and then they expand." The company has also experienced a sort of reverse migration. Overseas under various brands, Frito-Lay sells flavors like roast chicken to the British, caviar to Russians, and spicy masala to hungry Indians. Occasionally, these find their way back to the United States: Limon began in Mexico, Krishnan says, and a ketchup-flavored chip now popular in Buffalo, N.Y., began in Canada. In the future, Krishnan says, even more of those overseas flavors are likely to hit the United States to cater to the country's ethnic populations. "Good ideas come from everywhere, especially when you think about the changing demographics of this country and how multicultural we're becoming," he says. "It's a matter of time."